Our puppets Kismet and Mophead taking a break on the set. We’re heading into our last few rehearsals before tech starts later this week. New faces, new movements and even some new puppets! We have loaded our cabinets, drawers and lots and lots of paper into the Mead Theater Lab at Flashpoint and are figuring out how Kismet’s story fits into this space. Looking back over the past months of rehearsal, here are a few (very tiny) videos of our experiments and ideas from this crazy journey. 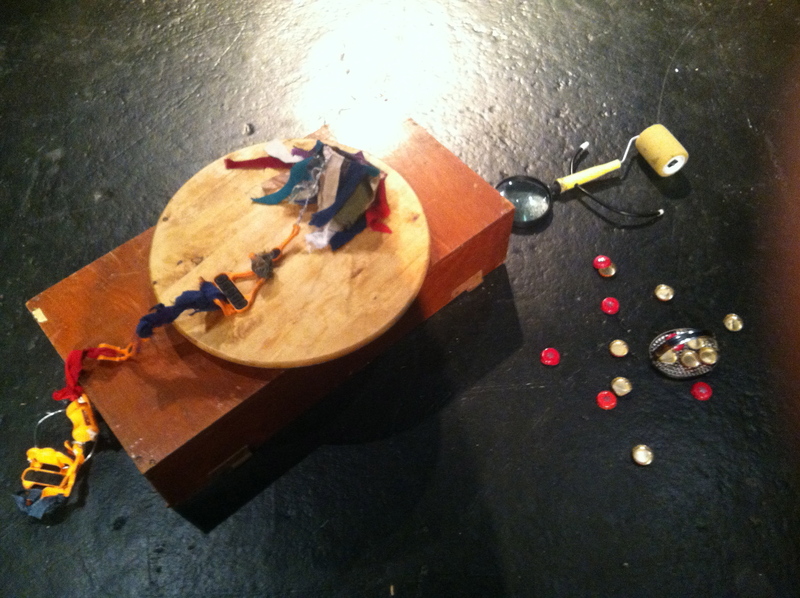 This entry was posted in Rehearsals and tagged Amy Kellett, Cabinets of Kismet, object puppets, puppetry, recycled materials, rehearsals, shadow puppets, video by ccbooks. Bookmark the permalink.